Not an arrangement for the ages, but I did manage this morning to hobble out into the backyard and cut these roses (re: foot surgery), so it represents progress. The big yellow and pink blooms are giving this end of the dining room a nice rosy smell. *Also, I’m not sure how to throw them away — garbage/recycling sorting is a very serious business here in Germany. I still have a collection from my last operation. Gorgeous flowers and a perfect vase for them. I have an artist friend who uses items from an ongoing medical condition in her artwork. These are single-use syringes, made so you can give yourself the shot (that ain’t going to happen; my husband does it). Unlike an Epi-pen, the needle is exposed when you pull off the cap, but after the shot, everything is retracted into the little plastic case. Ingenious and visually pleasing (and they really don’t hurt). The vase looks like a sea urchin and the roses in it are lovely! 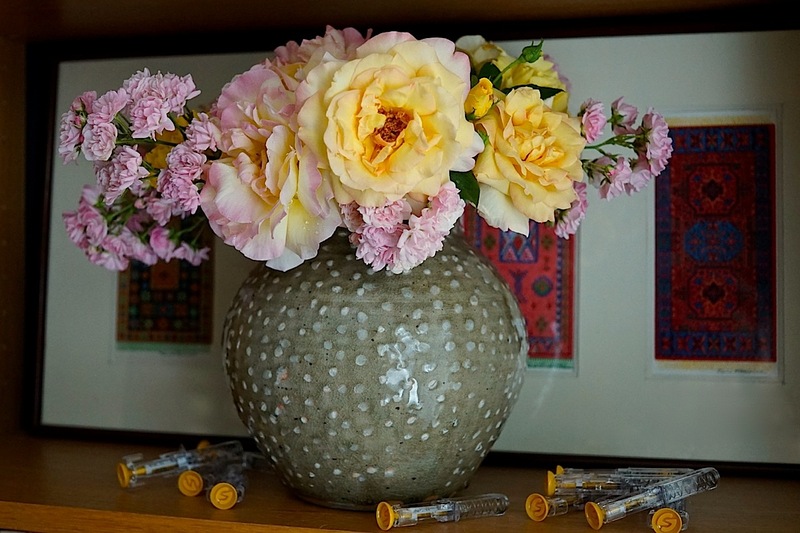 The syringes pick out the colour of the vase and the yellow roses and are a really quirky idea. Hope your surgery was a success. It does look like a sea urchin — I hadn’t noticed before. All is going well with the foot. I’m looking forward to my final x-ray, so I can start to walk on it. Syringes to your local pharmacy? That is what we do here. 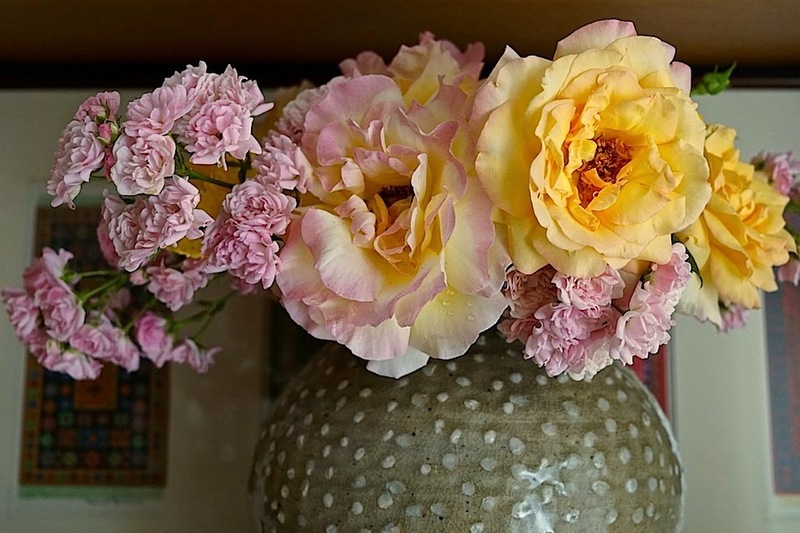 Beautiful vase – I miss your Rwandan stories. There was something on a local Facebook group about how they can just go in the trash, but it’s hard to believe. Once I can go into our closest town, I’m going to ask at the pharmacy. Ours goes to landfill, so prefer the pharmacy to medical waste to proper disposal route. Cindy, i’ve been away from your blog too long. Sorry to hear you’re recovering from surgery, but I’ve got to think that beautiful vase full of roses would make it more pleasant.